I wasn’t a fan of the first Division. When a game bears the name Tom Clancy, I expect the player, allies, and the baddies to go down with only a few shots fired. But that’s not The Division 1. And that’s still not The Division 2. The Division (1 and 2) is unlike other Clancy games in that they are RPGs. Sure, many Ubisoft games include RPG mechanics (choice, leveling up, skill trees, etc) but you don’t get more powerful versions of the same gun in Ghost Recon: Wildlands. There’s only one M4. 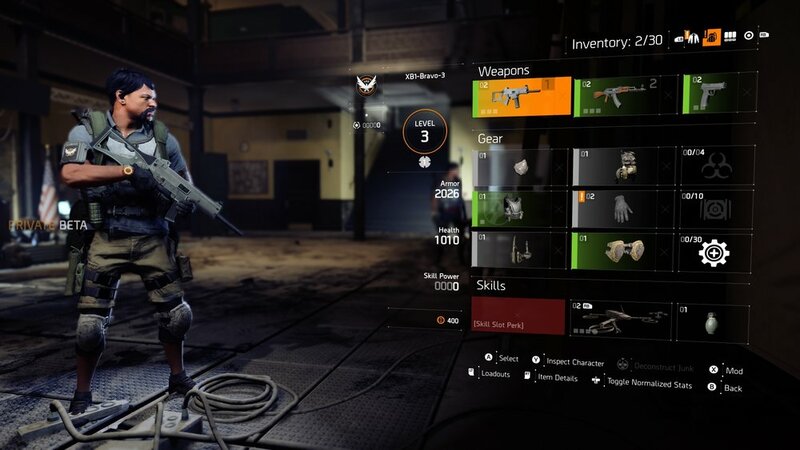 In The Division (1 and 2), there are many M4s that are dropped by enemies, picked up in loot boxes, and given as a reward for completing missions, and each one will have improved and/or different stats than the previous ones. I may be harping on this, but like Jacob Marley being dead, what The Division 2 is must be understood or no good will come out of it. So, if you’ve never played it or you need a refresher, The Division 1 is an RPG set in the New York City where a deadly virus has run rampant after being released on Black Friday. Whereas most RPGs have you traipsing around a fantasy or sci-fi world with swords and sorcery, The Division places you in a realistic setting and replaces the swords with guns and the sorcery with technology. With that out of the way, The Division 2 takes place approximately seven months after the original game. The virus wasn’t contained, it’s spread across the world and chaos now reigns. You, a member of the titular covert organization, receive a distress beacon from Washington D.C. and make your way there to find it in ruins. Immediately upon starting my session with The Division 2, the quality jump in presentation stood out to me. The visuals are superior to the original game in virtually every aspect. I didn’t get to play the prologue, but I played a handful of missions set early in the campaign, roamed the streets of D.C. and got to play two missions from the endgame. During my time with it, I was pleasantly surprised with how good the game looks. FYI, the version I played was running on an Xbox One X.
Washington D.C. is beautiful much in the same way that The Last of Us is: buildings are crumbling and nature is taking over, grass is growing through the cracks in the asphalt and ivy is hanging from buildings, cars are piled on top of each other and settlements are built with scraps. D.C. feels far more interesting the New York ever did. Maybe it’s that few games are set there, maybe it’s the more clearly post-apocalyptic vibe, maybe it’s the juxtaposition of Christmas decorations still being up during summer. Maybe it’s all of those aspects combined. Maybe it’s actually none of them but world of The Division 2 seems like a much more interesting and a much more rewarding place to explore. I don’t know about you but I skipped almost all of the cutscenes in The Division 1. They just weren’t interesting. 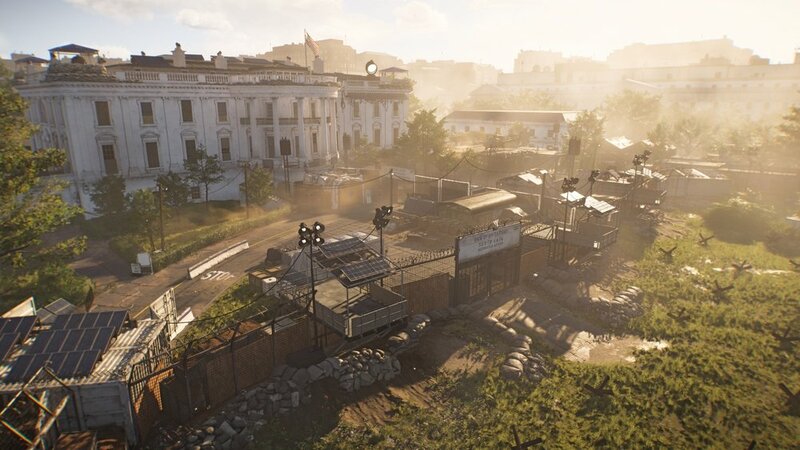 But Ubisoft is bringing more of their cinematic chops to The Division 2. Obviously, characters look better but they’re also more memorable in their design. One of the first characters I met was a woman named Odessa, she is the leader of one of the small settlements in D.C. you’ll be working with. She’s buff and she has several scars that are still healing but you find her at a low moment where she’s vulnerable and needs help to get her daughter back from one of the enemy factions, the Hyenas. Additionally, camera angles are more dynamic, voice acting is better, and it all comes together in a way that makes me feel like Ubisoft actually wants the player to care this time. Continuing with the idea of making the player care, you’ll now see a more direct impact from your involvement in the game. As you complete missions for the JTF and the two civilian settlements in the area, you’ll see the environments build up and improve. You’re not the only one trying to advance your standing in the world however. Factions make a return from the previous game and you’ll find their members intelligently patrolling areas, scavenging for materials, and trying to extend their own boundaries. Factions from The Division 1 always felt like something from a comic book. I mean, a group of former janitors and sanitation workers that use flamethrowers and call themselves the Cleaners? That’s a Batman villain. Thankfully, the new factions make more sense and seem to have more of a philosophical drive. First, there’s the True Sons, which is a militia-esque group led by a Joint Task Force defector. Then there are the Hyenas, who I dealt with the most in my play time, who are more like a gang of raiders and scavenger, doing whatever they need to survive. Then there are the Outcasts, civilians who were forced into quarantine, have been rallied by some sort of charismatic leader, and now want revenge. Finally, there’s Black Tusk. From what I played, Black Tusk is easily the most memorable of the factions. During a mission in which I knew I was going to fight the Hyenas, if you asked what faction I was fighting at any random point while I was playing, I wouldn’t have been able to tell you. That is, except, for Black Tusk. For one, the challenge they pose makes them lodge themselves in your memory. Additionally, they use equipment completely different than the other factions, indulging high-grade military weaponry, robot dogs, and drones. That’s right, robot dogs. If you played The Division 1 and didn’t like it, I have good and bad news: enemies are still spongey but they are much less spongey. Again, talking to Mr. Gerighty, one of the main goals in making The Division 2 was to make combat more fun. While it is an RPG, it looks like a shooter and therefore it should play more like a shooter. And that is definitely the case. From what I saw, there are three tiers of enemies: ones with red health bars, ones with purple bars, and ones with yellow bars. Like the previous game, red enemies are lower tiered and are generally easy to kill. They still pose a threat, especially in large groups but they can be dispatched the way you would expect, given the brand. New to the table are purple enemies; they are stronger because they have armor and have specializations, such as medic. So, now enemies can be revived. And then there are yellow enemies. They are well armored and tough. One big difference between The Division 2 and its predecessor is that while armored enemies still soak of a lot of bullets, it feels better to fight them because you can chip off their armor. This exposes weak points and allows you to do more damage. In general, everything is less spongey feeling and more satisfying but there still is a noticeable amount of sponge compared to other games in the Tom Clancy franchise. In the endgame mission I played, I was able to play with one of the new specializations that you can choose when you reach level 30. Each specialization awards you a powerful weapon unique to that class. Sharpshooter grants you access to a high-powered sniper rifle. Demolitionist gives you a grenade launcher. And Survivalist let you wield a giant crossbow. I got to play with the giant crossbow. Unfortunately I didn’t get much time with it as I experienced a glitch in the ammo spawning. The game is still in development after all. I’ve been told that the bug is already fixed, which is great, but I can’t really comment on these weapons any further because of it. Thankfully, the normal weapons were up to the task. There are quite a few differences to the loot and inventory systems but the biggest and best one I saw was in how weapon modifications are handled. Instead of picking up thousands of barrel grips, laser sights, scopes, and magazine extensions only to have to cull through them, dismantle, and sell them, you now unlock mods through the perks system. When you level up, you’ll get tech points to spend on modifying your skills and increasing the number of grenades you can carry, as well as several other options. Additionally, these tech points can be spent on mods. Once a mod is unlocked, it can be applied to any weapon that has a slot for it. This does two things: it reduces the sheer amount of inventory organizing you have to do and it makes mods more rewarding. Now, you don’t have to wade through dozens of mods you don’t want, you can simply unlock the ones you do. Especially in the endgame missions when I had dozens of mods unlocked, I quite enjoyed being able to fine-tune my weapons. I may have sort of fallen in love with my super-stable LVAO-C with silencer and 60 round clip. And the fine-tuning will continue in multiple ways. Talking with Keith Evans, the senior lead designer at Red Storm, the team has some lofty goals for the first year of The Divisions 2’s life. First are three narrative episodes. They weren’t able to go into any specifics as to what all will be included in these DLCs but, for the first time, The Division will receive content that expands on the story and characters featured in the game. Next is an eight-player raid mode, though details were even scarcer on this mode. And finally, three more specialization classes will be released for endgame gameplay. Best of all, all of this will be free as to not divide the player-base. Overall my time with The Division 2 was far more enjoyable than any time I’ve spent with The Division 1 and talking to the developers makes me think that they learned from the mistakes on the first game. The game seems incredibly ambitious and I’m very interested to see how interplay with factions will play out. If nothing else, however, it’s shaping up to be a much better version of what The Division 1 currently is and took three years to become. If you want to try out the parts of the game I played, then you can sign-up for the upcoming private beta, which will run from February 7-10, here. The Division 2 officially releases on March 15 for Xbox One, PS4, and PC.